“Self-esteem” is a word loaded with different implications: to some people, it calls to mind the participation-trophy-philosophy of youth soccer, where every player is an MVP, even if he scores on his own goal. To other people, “self-esteem” is a new-age YOU word demanding that YOU turn Yourself into the Best YOU Ever. No matter its interpretation, “self-esteem” is often grounded in a catchphrase devoid of much utility. Fortunately, our fifth CRP entry is on Nathaniel Branden’s The Six Pillars of Self-Esteem, a book that gives you concrete and practical ways to reflect seriously on your own self-worth. So why should I listen to Nathaniel Branden? Nathaniel Branden is pretty much a “guru” on self-esteem. This guy just never quits. Like an artist to a block of marble, Branden has spent the better half of his life studying and writing book after book about Self-Esteem, each time chiseling away at all the excess to sculpt the quintessential guide to Self-Actualization. 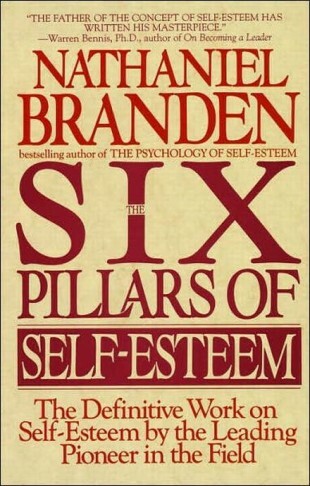 Branden even admits himself that the topic of self-esteem leaves a lot to be discovered but The Six Pillars of Self-Esteem does a great job presenting six basic practices to maintain a healthy mind and self-image. “The turbulence of our time demands strong selves with a clear sense of identity, competence and worth,” writes Branden. Whether you are trying to attract women, accomplish your career goals, or simply walk down the street feeling more complete, practicing good self-esteem will only enrich your life for the better. Self Esteem is Determined by You and No One Else. Early on in The Six-Pillars, Dr. Branden makes an acute observation: To avoid being a braggart, people attempt modesty in the hopes that others will point out their accomplishments. “This attitude is typical of those who believe one’s self-esteem is primarily determined by other people”. This is absolutely wrong. While recognition is a great reward, there is nothing wrong with being confident in one’s own right to be happy. There is nothing wrong with being proud of your accomplishments and wanting to share what makes you great with the rest of world. If we spend all our time trying to elicit people’s admiration and recognition, we diminish our self-worth by not believing we are worthy of it in the first place. The difference between Self-Esteem and Arrogance. Life is not about being on top but simply enjoying the fortune of your existence. People who are looking for recognition and envy are usually quite the opposite of self-assured. Those with high self-esteem are typically just happy to revel in their fortune without measuring it against the fortune of others. Alright Already! What is Self- Esteem? Self-esteem is not a competition; it is not a measure of worth but more a measure of how much one values his own self. “To be efficacious is to be capable of producing a desired result”. Taking on this project was a challenge for me. I have never been a quick reader and certainly have never written anything that has been published for a mass audience. So I admit the challenge was a bit overwhelming since failing would not only let myself down but the people I was writing it for. At one point I thought I was way in over my head: “What right do I have to write an article on self-esteem?”. Almost everyone has, at some point, self-sabotaged themselves. Perhaps it was a promotion they were interviewing for or a relationship with someone they thought was too good for them. Whatever the stakes, whatever the losses, self-sabotage is usually followed by the same thought: “I deserve this”. This behavior is not only self-destructive. Just as it not the responsibility of others to nurture our self-esteem, it is not their decision but our own whether we are worthy of happiness. Worthiness is the other half to having healthy self-esteem. While maintaining the self-efficacy to work towards our goals, we must also “consider ourselves worthy of the rewards of our actions”. So What are the Six Pillars? It’s not an uncommon trend for us to believe we have learned all there is to know. That we are the way we are and there is no more room for growth. We reach a point in our lives where we think “this is it” and just live day in and day out pondering the past and wishing for the future. Nathaniel Branden argues (and I agree) that this is counterproductive. In order to maintain healthy self-esteem you must focus on the one thing you can control: the here and now. This means being conscious of what is happening in the moment, being conscious of the direction you are heading and making the necessary adjustments to make sure it’s the direction you want to be going. 2) The Practice of Self-Acceptance. I think it is safe to assume at one time we have all blamed someone or something for a certain predicament. Usually it is our parents; they didn’t love us enough, support us in our dreams, or treat us like adults. Maybe it’s a boss who won’t give us a promotion or a teacher who is not allowing us to pass a class. In the end it’s all the same thing: we are finding security in playing out the victim in our own stories. Throughout the The Six Pillars, Dr. Branden makes a point to remind us that “no one is coming to save us.” We can play the victim all we want but in the end our own actions are the only thing under our control and blaming others for our problems while waiting for another to save us will lead to nothing but disappointment. Personally, if there was one pillar that someone could adopt to be more self-assured it would be this one. The majority of the world is filled of people just trying to get by in life; working nine to five jobs and maybe another part time gig on the side just to make ends meet. Their leisure time is spent playing video games, watching movies or passing time drinking with friends. And all of them have a dream in life of what they’d rather be doing but the opportunity to do so never seems to present itself. “Living Purposefully” means not only having goals in life but living in a manner that drives you towards completing them. This can be incredibly scary for some but that only underlines its importance. If we are too afraid of failure we are lacking both self-efficacy and self-respect by not allowing ourselves to attempt to reach our full potential. Just as we must be self-assertive and vocal about who we are and our beliefs, we must also work diligently to remain congruent with who we want to be. Essentially Nathaniel Branden’s point is that self-etseem is more like a muscle than a blessing. Instead of being something bestowed on us, we must work towards maintaining our self-esteem. We cannot be lazy in regards to our body as well as our emotional development. Like working out to maintain physical shape; there is no ceiling, you are always maintaining yourself. And just like working out, this may require us to endure discomfort from time to time. But as the saying goes, “the things worth doing in life are hard”. The first step in building self-esteem is having the willingness to embrace change; to challenge oneself to grow beyond his current comforts, to believe “I am lovable and capable.” It is a choice, first and foremost, to practice the six-pillars of self-esteem, and no one can make that choice except you.